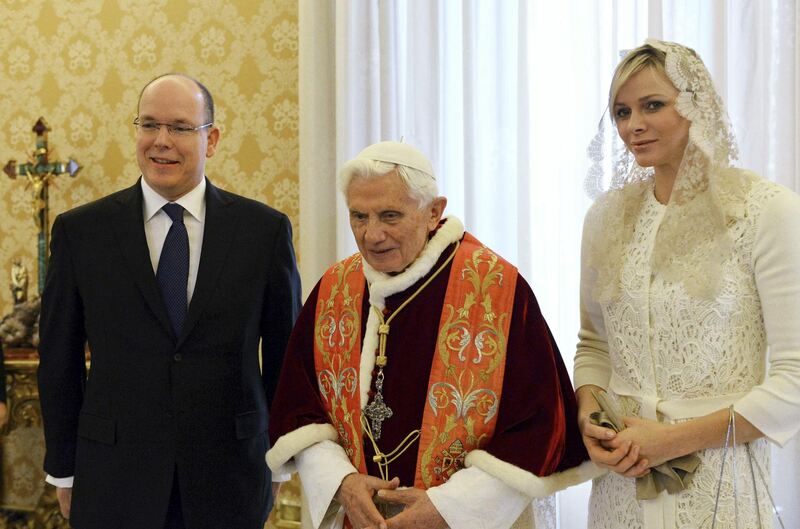 This morning, Prince Albert and Princess Charlene attended Audience With Pope Benedict XVI in Vatican City, Vatican. 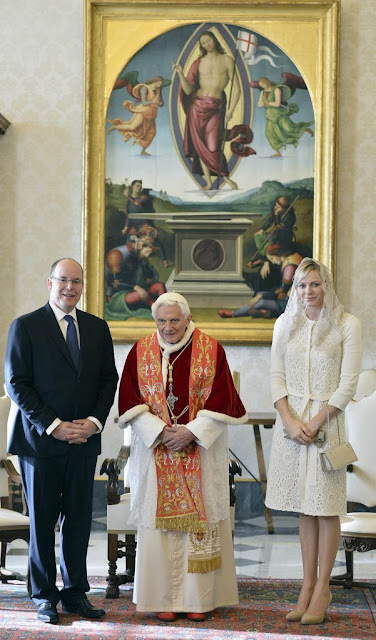 For the occasion Princess Charlene chose an amazing Christian Dior off-white dress and coat. No one knows exactly if the princess was granted the Privilège du Blanc, which only the Catholic Queens (monarchs or consorts) (Queen Sofia of Spain, Queen Paola of The Belgians, Queen Fabiola of Belgium and Grand Duchess Maria-Teresa of Luxembourg) are eligible for, because if Charlene wasn't, then she has made quite a mistake. But since dress codes are usually sent clearly, royals usually stick to protocols and dress codes, and Charlene specially prefers to stay on the safe side when it comes to important and official engagements, I think she was granted the Privilege recently. Princess Grace never wore anything but black when visiting a pope in Vatican! Princess Charlene's outfit is confirmed to be by Dior. It's a regular piece from the boutique (not costum made, not Haute Couture), although not seen on the runway, maybe it's one of those pieces produced regularly! Charlene teamed her dress and coat with a spectacular white mantilla that looks like an antique piece, beige gloves and an Akris Purse. The Princess of Monaco completed her attire with what I believe to be her Vikki pumps by Jimmy Choo. I'm Absolutely loving this outfit, and I just love it when Charlene of Monaco wears Dior, she's looking so chic and put-together and most importantly: appropriate (if she's allowed to wear white). And I love her makeup and mantilla. UPDATE: The Vatican's Press office has confirmed in its statement that Charlene was allowed to wear white, which means that the Privilege of White was extended to her too. P.S: We're on a hiatus for a few days, my less than royal exams! No, she was not granted the right. She chose to wear a cream color, not white on her own. She is on the net reading and knew what was allowed. Cherie Blair wore white so she would too. Tacky. 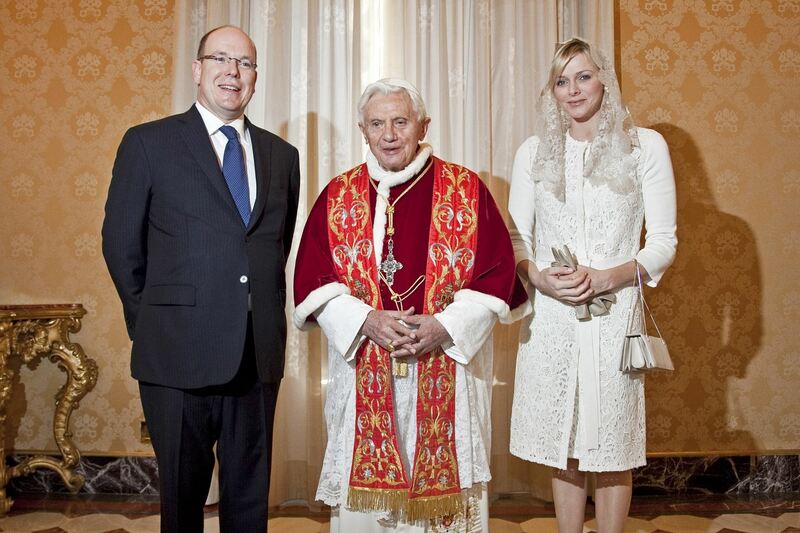 She was allowed to wear white because she is the consort of a Catholic monarch, Prince Albert; AND she is also Catholic. She converted prior to her wedding. If she had not, she would probably have worn black. Interesting - who knew there were such rules! In any case, she looked lovely. I'm turning into a Charlene fan. Yes, she looks wonderful, a true princess. How people can think she is tacky, is beyond comprehension. I think she is going to surprise everyone and turn into one of the best moves Prince Albert ever made for his principality. On another page a comment was made that she looks unhappy. One can only shake your head. 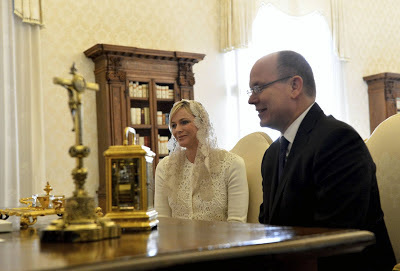 The princess had an audience with the Pope, not Michael Mcintyre. She's cute and stylish. Totally opposite to Kate M. - that one is a hopeless case of lacking style. When The Spanish Get Glamorous!